It's Time to Take a Stand. Despite its compact size, the V-Ride boasts many full-sized features like hydraulic oil coolers, dual hydraulic pump dual wheel motor drive system, coil-suspension platform, and a heavy-duty steel main frame. Pair a powerful Kawasaki FX, Kawasaki FS or Kohler EFI commercial-grade engine with a 36" Advantage™ or a 48", 52" or 61" Velocity Plus™ deck and you have an ideal combination of agility, power and performance. With a low center-of-gravity and extra-large drive tires, stability is never compromised. The operator rides on a coil suspension platform which delivers bump soaking, back and knee saving travel. The operator comfort pad is adjustable to fit different operator sizes and riding styles. This is truly the ultimate stand-on mower with excellent handling, stability and quality. No cut corners, no compromise, nothing but top quality construction and unmatched performance. Don't take our word for it. 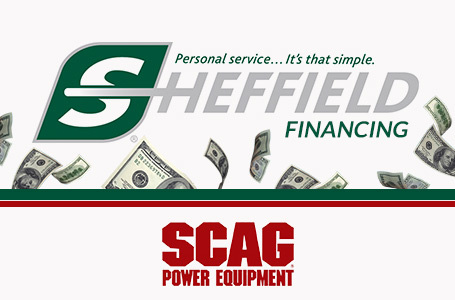 Contact your local Scag dealer for a demonstration today and experience the Scag difference for yourself. Available in several model configurations to fit a wide range of professional lawn maintenance needs. Compact size allows more units to fit on a single trailer. Up to 11 MPH forward speeds (on 61" models) and up to 6 MPH reverse speeds keep productivity at a maximum. Up to 8.5mph forward on 48" & 52" models. Up to 7.7 mph forward on 36" model. 36" Advantage or 48", 52" or 61" Velocity Plus™ Cutter Deck deliver an immaculate quality-of-cut. Three year limited warranty on the cutter decks. Spacious operator platform with coil suspension delivers a smooth the ride and reduces operator fatigue. Springs are with 3.5" long and provide 1.25" of suspension travel. Operator platform is made from heavy gauge steel with extruded star pattern for no-slip footing. The platform can be flipped forward to allow for more trailer space and also allows the mower to be driven (with or without the blades on) while walking behind the mower. Platform is wide and unobstructed. Kawasaki FX series engines are commercial-grade and feature canister air filters, and twin barrel carburetors. Kawasaki FS engines feature dual element air filters and single barrel carburetors. The Kohler EFI (electronic fuel injection) engine is incredibly powerful and an efficient powerhouse. The engines will start easier and is more fuel efficient than carbureted models, reducing overall operating cost. Auxiliary hydraulic oil cooler (on the 48", 52" and 61" V-Ride) keeps oil temperatures well within a safe operating level and adds to hydraulic system component life. Scag tough main frame construction delivers solid strength and ensures years of trouble-free service. The main frame was designed for strength and longevity. Ogura GT 3.5 (61" V-Ride) or GT 2.5 (36", 48", 52" V-Ride) PTO clutch brake engages and stops the cutter blades smoothly and safely. Adjustable air gap ensures long component life. Convenient, full-featured instrument panel has ignition key, PTO switch, Drive & Neutral lever, throttle, choke, and digital hour meter. The fuel gauge is located on top of the fuel tank, right next to the instrument panel for easy viewing. Drive & Neutral lever - When in Neutral, the steering control levers are locked, preventing accidental movement by bumping the controls. In the Drive position, the steering controls have full, complete range for mower operation. Operator Comfort Cushion can be mounted in different positions, fitting different operator sizes and riding preferences. Large diameter, padded steering control levers are very comfortable and easy on your hands. The hand force required to control the V-Ride is minimal and the lever action is extremely smooth. Heavy-duty blade drive spindles provide reliable performance season after season. 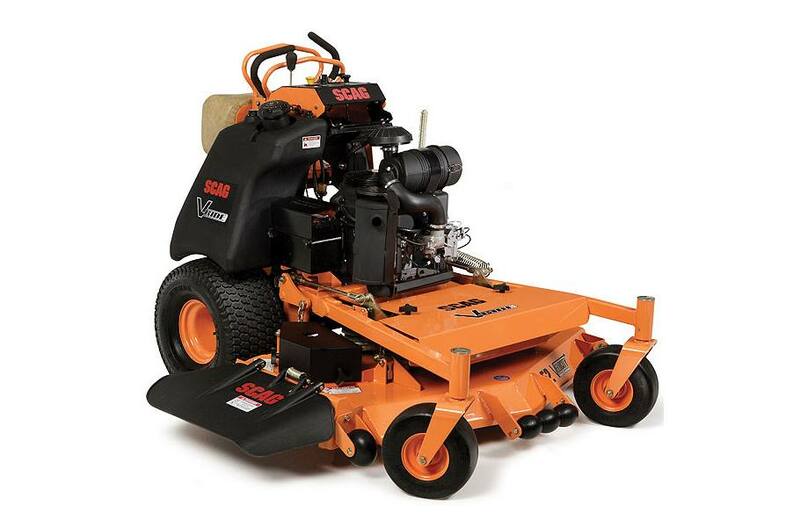 The Scag spindle is more than tough enough to handle the high horsepower and torque requirements of this mower. Three year limited warranty on the spindles. Dual 12cc (61" V-Ride) or 10cc (36", 48" and 52" V-Ride) hydraulic pumps and dual 12ci cast iron, high-torque wheel motors provide smooth, positive and reliable power to the drive wheels. Pressure relief valves in the pumps protect the system from internal pressure spikes and add to pump life. 8 gallon (52" & 61" V-Ride) or 5.5 gallon (36" & 48" V-Ride) fuel tank keeps you in the field cutting grass. Fuel tank features a fuel level gauge and an extra large, angled filler neck for easy filling. Interlocked parking brake prevents the mower from being driven with the brake on, stopping premature brake wear. Auxiliary canister air filter system is standard equipment on all V-Ride mowers with Kawasaki FX engines. This provides extended service intervals and longer engine life. Easily adjust cutting heights with the convenient, easy to lift hand lever. Wide range of adjustment from 1-1/2" to 4-1/2" in 1/4" increments. Auto-lock in transport position with a simple thumb release. Deck leveling adjustment brackets at all four corners of the deck allows for easy in-the-field deck leveling and pitch adjustment. "Split-Steel" pulleys are used on load carrying areas like the cutter deck spindles and pump drive systems. Split steel pulleys are stronger than cast iron or stamped pulley designs. Our pulleys are strong for long life and lightweight for reduced inertia and decreased wear on the cutter deck drive system. Tapered locking hubs are used on spindle shafts and pump input shafts for easy pulley removal and service for years to come. No plastic pulleys - Some [other brands] actually use plastic pulleys on their mowers. Not Scag. All Scag pulleys are made from metal. Plastic is for toys. High-quality bearings and bearing debris guards on idler pulleys ensure long, reliable service. Self-adjusting belt systems effortlessly keep belts in constant adjustment for maximum life and minimum maintenance. Tapered roller bearings are utilized in the front caster wheel axles and caster yoke pivots for durability and reduced maintenance. Extra-large 20 x 10.5 - 8 inch drive tires ensure better traction, less turf tearing and easy curb climbing (36"models have 18 x 8.5 - 8 drive tires). Drive tires are 4-ply for added durability. 13 x 6.5 - 6 (61" V-Ride) or 11 x 4 - 5 Flat-Free front caster tires (36", 48", 52" V-Ride) and eliminate the downtime associated with flat tires caused by debris, thorns, etc. Four tie-down points are built-in on the front and rear of the mower (2 front, 2 rear) for fast and convenient loading and unloading on trailers. Front weight system (under the front belt cover) can be customized with fewer or additional weights. 36" V-Ride comes standard with two (2) 35lb. weights. 48", 52" & 61" V-Ride come standard with one (1) 35lb. weight. Up to three (3) weights total can be installed at one time. Custom-Cut Baffle allows you to customize the cutter deck to your individual cutting conditions. Simple, easy to service, neutral and tracking linkages. It's the same design that we use on other Scag riding mowers. No cable systems or complicated bracketing. Straightforward designs with proven reliability. User-friendly mower design allows access to the engine and filters, for easy maintenance. Engine oil drain hose included. Solid hillside stability due to a low center-of-gravity, large tires and a wide stance. 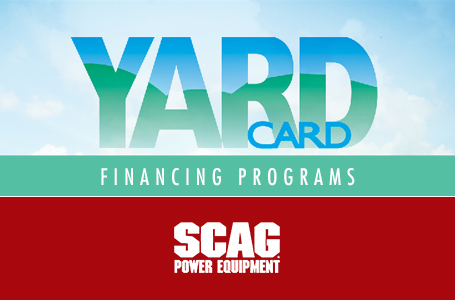 The Scag "Simply the Best" commercial warranty stands behind you and your mower for years of profitable service. Marbain cutter blades stay sharp longer for reduced maintenance. 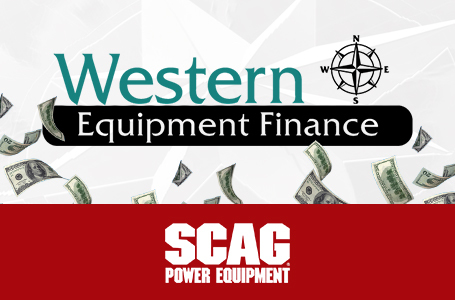 High quality electrical components such as switches, wiring and harness looms are used throughout the Scag mower line for dependable service. Laser cut, vented rear panel allows for increased air flow and cooling for the hydraulic pump drive system. Blow out debris with compressed air or a blower without having to remove the panel. Sealed fuse holder keeps the elements out to help prevent corrosion and electrical issues. Fuel tank shut-off and fuel gauge are located on top of the tank, near the instrument panel for easy access and viewing. Length (foot plate down): 71 in. Length (foot plate up): 67 in. Width (chute down): 47.75 in. Width (chute in transport position): 37.25 in. Fabric Bag Grass Catcher GC-F4: The Scag Fabric Bag Grass Catcher features a 4-cubic-foot capacity and is lightweight for easy dumping. Chrome Wheel Covers: 12" chrome wheel covers will add 2MPH to your Scag mower....ok, maybe not. But they look awesome! Cutter Blades: Scag offers a number of unique cutter blades to tackle any job or condition. Mulch Plate: Discharge opening block-off plates for 48" & 52" Cutter Decks. Hurricane Plus Mulching System: Complete mulching systems with individual chambers for the best possible mulching performance. OCDC: Operator Controlled Discharge Chute allows you to quickly and easily block off the discharge chute while mowing. Blade Buddy: Slide the Blade Buddy over the end of your cutter blades during blade changes to keep the blade from turning. *Actual ground speed may vary. Specifications subject to change without notice or obligation. Gear up now for a great season! 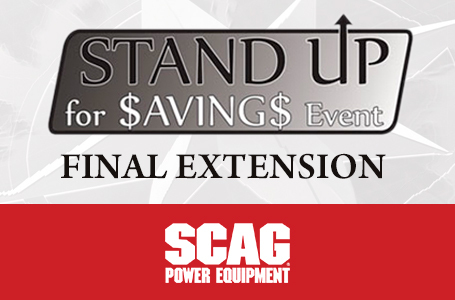 Don't miss out on limited-time savings on the Scag V-Ride II zero-turn stand-on mower. 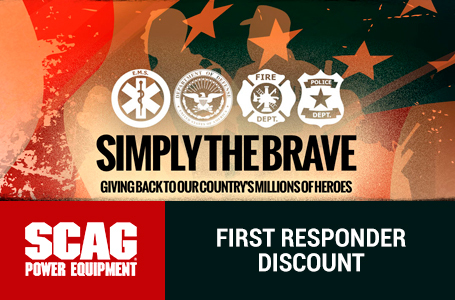 Now through the end of March, all Scag V-Ride II purchases are eligible for special pricing. This deal is subject to dealer participation. Consult with your Scag Dealer for details. New V-Ride II mowers only. Offer valid while supplies last. Not valid on past purchases. All qualifying units must be purchased and registered between March1st and April 30, 2019. Offer subject to termination at any time without notice or obligation.FINAL EXTENSION!